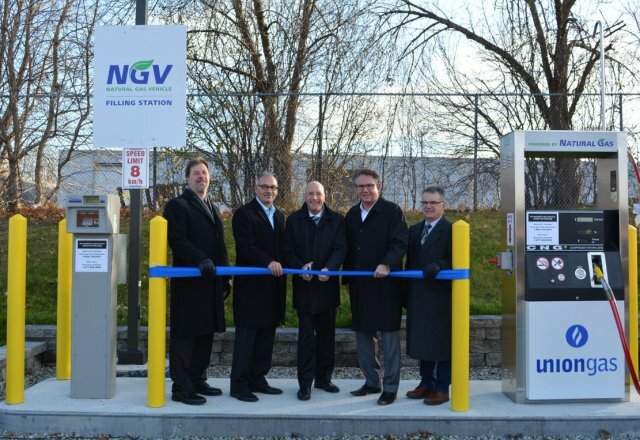 Union Gas launched a fueling station at its London Ontario office located at 109 Commissioners Rd. W. at an event that highlighted the importance of CNG as a better choice for Ontario cities and local economies to fuel fleet and heavy transportation vehicles. The new facility will refuel six trucks in Union Gas’ fleet, which has plans to convert more trucks to CNG over the next few years in an effort to reduce emissions and lower fuel and maintenance costs. As Ontario implements the Climate Change Action Plan natural gas will provide many opportunities to contribute to a more energy-efficient and prosperous low-carbon economy.